Why are anglers so daft? Last night the weather forecast said that rains would move from the South West and arrive and soak the South East by mid afternoon! On the A3 at 7am, the ‘Today’ programme said the same, as I headed to Portsmouth. Coming out of the Hindhead tunnel and with the South Downs in sight, or at least almost, as the cloud base was so low, I knew rain was already falling, and I wondered whether to turn around and head back to London, but I reasoned, I would catch up with the commuter traffic and this would make that option rather tedious, and besides, I was only twenty miles from a Wight Link ferry, and having made the effort why not continue? Even if by now it was tipping down! But clearing the Downs and with Langstone Harbour, now in view it was dry….so that was a good decision! £52 later and I was on board the 8am ferry to Ryde, and it started raining, and rather seriously…yet again the forecasters were wrong, as the rains arrived early. It was to the Medina at Newport I drove, to check out what the EA’s Dom Longley had suggested as an opportunity. Walking wader jacketted, my top half was protected from the rains, but not my light weight walking trousers, but they dry quickly, and whilst noting this tiny stream might deliver what I sought, I was already too wet to bother fishing, so set off in a south westerly direction, and toward Shalfleet, in hope that Dom’s primary thought might deliver! 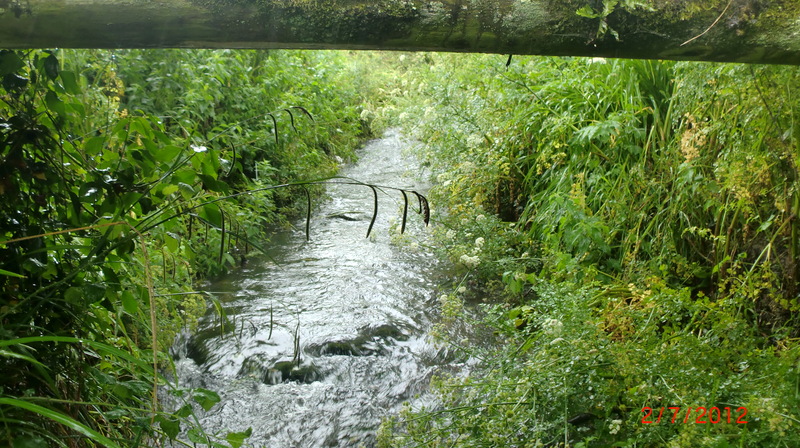 The Caul Bourne is a tiny ‘river’ but considered to be one of the Isle’s main waterways, and it flows for just 8 kms from Calbourne to its estuary at Newtown. 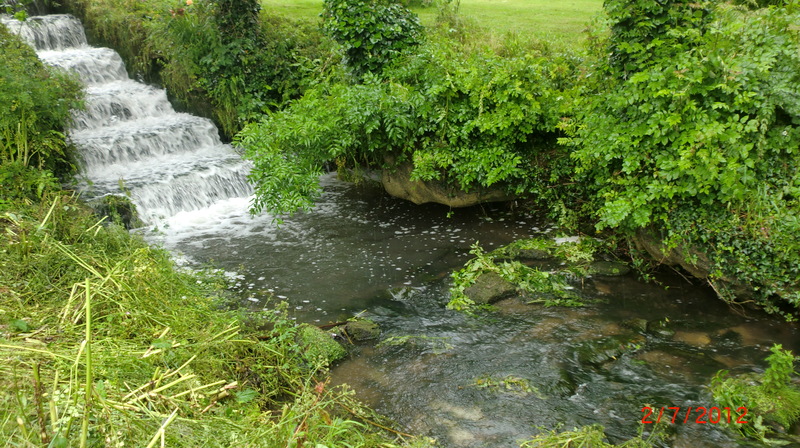 It meanders, wood bordered, through farmland, and I sought out fishable bits, driving along single track roads close to Newbridge, until a road sign highlighted a weak bridge, and I encountered such bridge close to a mill, and stopped to peer into a shallow, pebble bottomed stream. Hhmm! 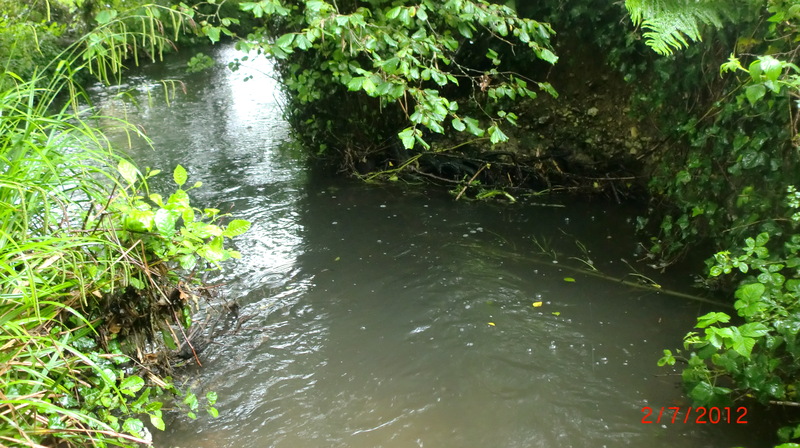 Meandering streams create little outer bend pools, which might just…! Rather wet yet again, I sloshed along a stony drive to enquire of the homeowner whether there were trout in his stream, and my arrival having been heralded by a duo of lovely Labradors, I was duly met by James, who whilst both amused and curious, generously allowed me on to his parents’ land to have a go, and bid me ‘good luck’! but …keep going! This was warfare…sneaking double-upped and under dripping weighted branches, flicking here, flicking there…. I thought I saw the splash of a moving fish, but it might have been a bigger rain drop. Either way, it motivated! And then, a deeper pool, perhaps three feet or so…but no takes. And then another bend, and another pool, but still nothing. And then another, and what was that? …a pull, another pull, it’s a fish, but what is it? 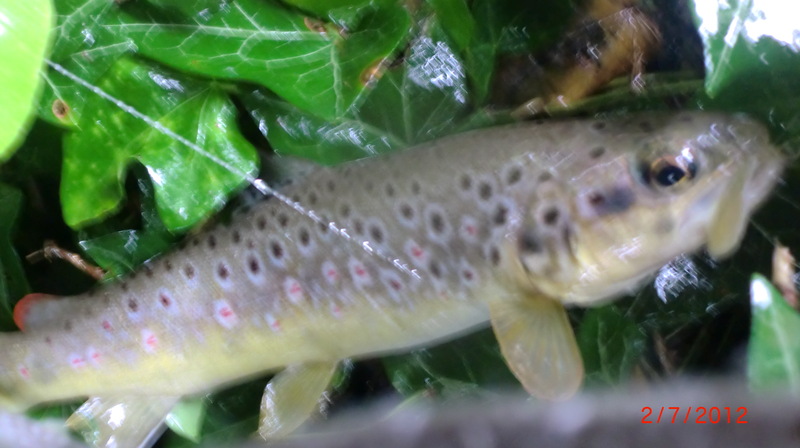 James had said that any fish were scarce in his beat, so when this one was close to the surface and I saw a spotted yellow flank, I was ecstatic. The outer edge of the pool was lined by filamentous roots, and I knew that taking him would require luck, and so carefully, and slowly I edged him closer, and after a few lunges, brought an twelve inch fish to hand. And I was lucky. 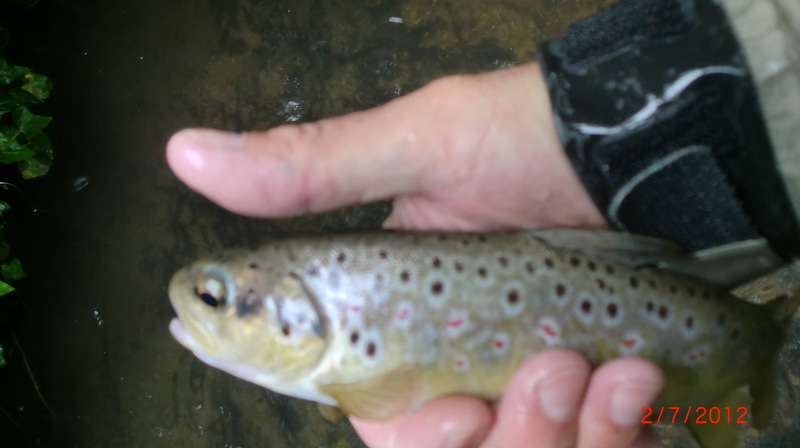 I had a bead headed #18 PTN on the point, and he had taken the #18 yellow caddis pupa on the dropper, so how the weighted nymph had not snared, I know not. Perhaps this was my reward for the daftness with which I had set out at 630am this morning ! I did not need another fish, and after only thirty minutes, or so, I returned to Tonka, extremely happy. I was wet through and did not notice, but stopped by to thank, young James, and share this picture. I thought that the Isle of Wight was always going to be difficult, but thanks to guidance from Dom Longley, my lovely fish means that I am 41 down, and now have, just five counties to go. As I discovered the weekend before last from an IOW taxi driver you only ever give your post code when buying on Amazon. That way it comes up as Hampshire and you save a fortune in p&p. If you admit to the IOW you can add another £20 to your bill. Well done, this fish sounds like a challenge. Off to the Medway tomorrow, rain predicted all day.